The Dexas Snack-Duo is a bottle for both water and snacks for your dog whilst out and about. 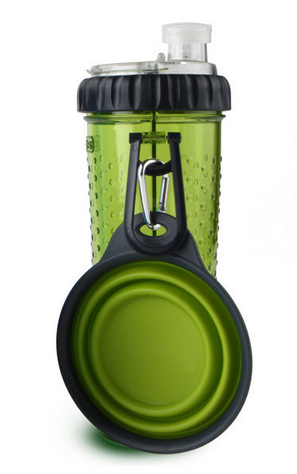 It is one of the first reusable bottles with a two sided chamber. Flip open the lid to dispense treats or kibble, then pop open the cap top to pour a cool drink of water in the attached collapsible cup. Water-tight cap top on liquid side, wide-mouth snap lid on the snack side.